Today was rations day. Yesterday I spent a fair amount of time going over the ration sheets provided by Claudia at the NOLs Rocky Mountain Branch. 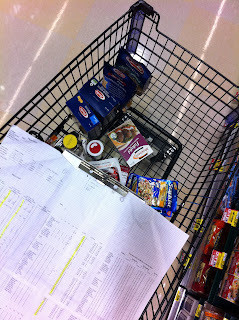 Today I rolled into our supermarket with clipboard and papers and started shopping. 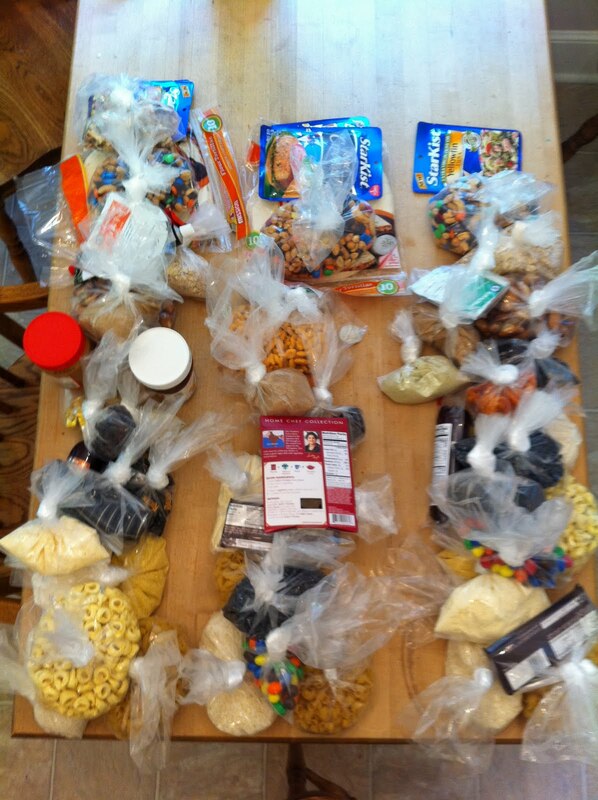 I will confess that I got some strange looks, but I spent about an hour shopping, checking weights, and portions and the occasional directions. 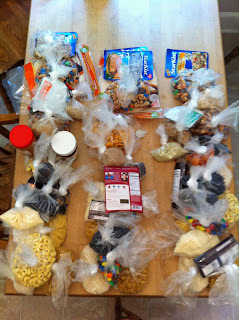 This is what it looked like when I arrived home, and after two hours of weighing and bagging, this is what it looked like sorted into 3 groups. Ration 1, 2, and 3. Ration one is a little bigger as it has some things that will last the whole trip like tomato paste, pesto, peanut butter and nutella. This is it packaged and ready to go in a kayak. There are still some things that need to go into the ration. "freshies" like onion, garlic, potato, carrots, and I certainly cant forget the cheese. I still need 4 pounds of cheese that I will buy in Skagway. All will hold up well for some time while inside the belly of a kayak. Power food, like cliff bars and the like. will go into the ration. The weight comes in just a touch heavy. As they are in that last photo the entire ration is at 30 pounds. The ration plan called for 36.75 pounds (1.75 pounds of food per person per day) I think I will be over once I add in the freshies. Then of course I need a spice kit, and coffee. And, ahem.... Whiskey. It will probably be right around 42 pounds. A little heavy. Did we give you that table? I know it's a silly question under the circumstances but it's been driving us crazy. We know we gave the table to someone (someone important). Chris, If I were backpacking I would get into dehydrating. But one of the beautiful things about paddling is once you get the boat moving, the weight isn't that much of a problem. And the beauty of 'freshies' is that they are fresh. Blackbird, You did give me that table about 9 years ago. Depending on your driving schedule, you might want to swing into Whitehorse (adding just about 25 miles total to your drive) for your fresh produce and cheese. Just came from a week in Skagway. They get fresh produce and grocery shipment in once per week. I found very limited produce there on Sunday. The shipment comes in on Monday and hits shelves on Tuesday. Two places to buy produce in Skagway - health food store and main grocer. Also a local produce stand that might have things by the time you get there. that is a very good piece of info! Thanks. I will either hit Whitehorse, or if I see something else as I get close I will add my freshies then. thanks a lot. The minutiae will kill you.